From the acclaimed novelist and The Believer editor HEIDI JULAVITS, a wildly imaginative and emotionally intense novel about mothers, daughters, and the psychic damage women can inflict on one another. Julia Severn is a student at an elite institute for psychics. Her mentor, the legendary Madame Ackermann, afflicted by jealousy, refuses to pass the torch to her young disciple. Instead, she subjects Julia to the humiliation of reliving her mother's suicide when Julia was an infant. As the two lock horns, and Julia gains power, Madame Ackermann launches a desperate psychic attack that leaves Julia the victim of a crippling ailment. Julia retreats to a faceless job in Manhattan. But others have noted Julia's emerging gifts, and soon she's recruited to track down an elusive missing person a controversial artist who might have a connection to her mother. As Julia sifts through ghosts and astral clues, everything she thought she knew of her mother is called into question, and she discovers that her ability to know the minds of others including her own goes far deeper than she ever imagined. 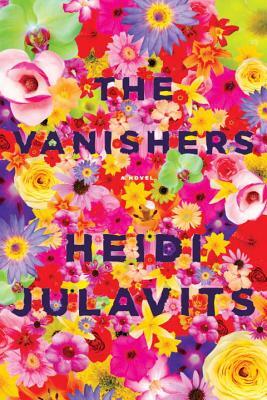 As powerful and gripping as all of Julavits's acclaimed novels, The Vanishers is a stunning meditation on grief, female rivalry, and the furious power of a daughter's love. HEIDI JULAVITS is the author of three critically acclaimed novels, The Uses of Enchantment, The Effect of Living Backwards, and The Mineral Palace. Her fiction has appeared in Harper's, Esquire, and The Best American Short Stories, among other places. She's a founding editor of The Believer magazine and the recipient of a Guggenheim Fellowship. She lives in Manhattan and Maine. "Darkly comic....sharp-eyed, sardonic, hilarious....Julavits is at her acrobatically linguistic best here. Nearly every page contains a showstopping description or insight...narrative voice is superb. Funny, self-deprecating, exquisitely attuned....Vivid....Remarkable....Heartbreaking." "Open The Vanishers to any page and you'll find some of the snappiest dialogue going. Stylish and fiercely funny, Heidi Julavits's fourth novel explores the imagined dangers and dizzying thrills of being a career psychic....Julavits is a fearlessly inventive writer, a risk-taker who never shies away from prickly, tangled, often meaphorical emotional darkness and constantly strikes out into unexplored territory....the sharply original narrative, which moves at top speed, [is] always entertaining and full of curiosities, deadpan banter, and metaphysical playfulness.....a wild, fun ride that doesn't let up until the last sentence." "Heidi Julavits has a questing, eclectic intellect....wry wit and linguistic exuberance. She creates a sophisticated symmetry in the final surprising moments of Julia’s story, and, as if in an encore, adds an adroit comic flip at the end." "Part coming-of-age story, part murder mystery, part absurdist romp, part neurological novel. I loved it.....Julavtis' characters are as earnestly bizarre as Haruki Murakami's, and she's as funny as Lorrie Moore.....wonderful and interesting complications....Julavits is so smart and funny, and her writing is so good." "Ms. Julavits is a keen observer of the high drama...An evocative writer, she conjures up the supernatural in a way that feels plausible....Lavish....Haunting"
"Thrilling, subversive insights...powerful in many ways....On the subject of loss in particular, Julavits is an expert, writing with eloquence and poetry.....sturdy intellectualism.....achieves a deepening of the novel's wisdom and insight....delivers a thunderclap of real feeling"
"A blistering read. Female aggression may lurk everywhere, but Julavits decides to unleash her antagonists in a quirky realm, the fictional Institute of Integrated Parapsychology, a New Hampshire school for students of the occult....funny, satiric and savage....the visceral kick of Julavits' prose....will provide a similar jolt of transgressive, feminine thrill." "Julavits is no ordinary writer, and the meta-heavy brilliance of her fourth novel is something akin to a Sylvia Plath poem transferred telepathically to a psychic who happens to be solving a missing-person's case while being film-followed by artist Sophie Calle." "Fantastic, deep and complicated...explores the way loss, disappointment, anger, deception and trauma can bleed down from generation to generation....a complicated, often troubling meditation on the complexities of relationships..."
"Bristling with wicked humor and sharp-edged irony, The Vanishers explores the ways in which the dead can haunt the living and the often painful persistence of memory"
"Clever....funny, affecting....an ambitious world that reveals the depths of matriarchal power structure....At the same time, Julavits does some clever twisting to the classic revenge plot....satisfying in all its attempts as a robust mystery, satire of academia, and finicky family drama." "Wry, witty....magical, and Julavits's often acerbic prose generates laughs despite the sad reality"
“The Vanishers is a fascinating inquiry into matriarchal structures: their power struggles, the projections, distortions and anxieties that result, and, above all, the creative - and destructive - energies that they unleash. A real achievement."